This post has been contributed by Dr Tomás Irish, lecturer in Modern History at Swansea University. He has recently released a new book looking at Trinity College Dublin in war and revolution, 1912-1923, available here. On 24 April 1916, nationalist rebels seized the General Post Office in the centre of Dublin, inaugurating the Easter Rising which would lead to a week of fighting in the name of a newly-proclaimed Irish republic. At Trinity College Dublin, the university’s porters, fearing the worst, quickly locked the gates to the venerable institution, already depopulated owing to the ongoing war. In the hours that followed, a motley crew of students, professors, and alumni organized the defence of Trinity. They were joined in this by a small number of soldiers on leave from the front, from Australia, New Zealand, Canada and South Africa. On the first night of the Rising, this improvised garrison numbered 44 men who acted in the full expectation of an attack upon the university, one which ultimately never came to pass. In the week ahead, Trinity would become the hub from which British forces suppressed the nationalist rising, although it would in turn inspire a war of independence leading to the secession of 26 Irish counties from union with Britain in 1921. Trinity, traditionally a unionist institution with strong links to both the government in Westminster and the British Empire, was out of tune with the nationalist revolution and found itself sidelined by the new Irish Free State, which prioritized funding and influence for the National University of Ireland, where many of the revolutionaries had been educated. This left Trinity both emotionally and practically distant from the new state in the decades following the latter’s establishment. Trinity College Dublin forms an unusual example of a university which saw its normal activities turned on their head by not one, but two conflicts in the second decade of the twentieth century. It found itself, in 1916, a site of mobilization for conflicts being fought at home and abroad. While the First World War was a transformative moment for universities in most belligerent states, few universities found themselves directly threatened by military action (with the notable exception of Belgian universities in August 1914). Moreover, none, to the best of my knowledge, found themselves unwitting participants in two different military affairs with conflicting aspirations. This was the experience of Trinity College Dublin in the period 1914-1922. British troops in Trinity College Dublin during the Easter Rising, 1916. The example of Trinity College Dublin, founded in 1592, exemplifies both the richness and the challenges of writing university history. At the turn of the twentieth century, TCD formed part of a wider academic world, with its lecturers travelling to international conferences, receiving honorary degrees from institutions elsewhere in Europe and North America, and its graduates frequently gaining employment elsewhere in the British Empire. This was exemplified by its tercentenary celebrations of 1892, where scholars came from across the world to honour one of Europe’s ancient universities. In an Irish context, Trinity was seen as antithetical to resurgent nationalism which had grown in strength in the decades before 1914: it had, until 1793, excluded Catholics, and was still a strongly Anglican institution. It was initially resistant to the teaching of Irish, central to the nationalist cultural revival, and it was a politically unionist institution. Moreover, TCD’s graduates elected two representatives to the Westminster parliament who were unionist in outlook. Indeed, Sir Edward Carson, the unionist leader by 1912, represented Trinity College Dublin (Dublin University) in parliament between 1892 and 1918. Cultural nationalists and nationalist publications frequently cited the institution as exemplifying all that was wrong with British rule in Ireland. The Leader, an especially vituperative nationalist newspaper, frequently referred to Trinity as ‘the Parochial University’ and ‘England’s Faithful Garrison’. The institution’s experiences in this period exemplify the tension between national and international concerns that mark the experiences of universities in this period, where academics and institutions (almost) universally supported the war and their respective national causes, leaving the appeals to the scholarly internationalism to one side while the conflict was ongoing. The engagement of universities in the war was not restricted to academic staff. Students volunteered for service in great numbers, with over 3,000 Trinity students, staff, and alumni undertaking some sort of military service over the course of the war, leaving classrooms empty and universities deprived of student fees. Cumulatively, the university was deeply invested in the prosecution of the First World War. The population of the university dropped from an average of 1,200 before the war to a low of 721 by 1917-18, while students and teaching staff mostly swapped academic work for war work for the conflict’s duration. Like their counterparts at universities elsewhere in Europe, TCD students volunteered for a myriad reasons: for adventure, out of a sense of solidarity with their fellow students, out of a belief in the righteousness of the cause. To this list can be added two more reasons: in 1914, the two major political factions in Ireland (unionist and constitutional nationalists: both of whom were led by Trinity alumni: Carson and John Redmond) were united in support for the war, and many Trinity students enlisted for this reason. Radical nationalism was still a minority movement at this time; indeed, in November 1914, Patrick Pearse, the man who would lead the Rising in 1916, was forbidden from speaking to the student Gaelic Society owing to his anti-recruitment activities. John Pentland Mahaffy, the Provost of TCD who numbered King George V and Kaiser Wilhelm II amongst his acquaintances, did not want ‘a man called Pearse’ disseminating his ‘traitorous views’ at Trinity College Dublin. The Easter Rising occurred in the middle of this unprecedented mobilization for war. Its leaders allied themselves to Germany and explicitly rejected the allied war effort. The Trinity community was steadfastly against the Rising and its goals and shocked by the devastation to property across Dublin’s inner city. However, the execution of the leaders of the Rising by the British authorities did much to lend popular support to the republican nationalism which grew in the years that followed, culminating in a War of Independence fought by nationalist insurgents and British military between 1919 and 1921. Trinity College Dublin found itself caught between two major national movements. In a British context, the wartime efforts of universities transformed their relationship with the state. The establishment of the University Grants Committee in 1919 created a mechanism through which British universities could claim state funding from a centralized body, remuneration universities for their wartime privations and ensuring ongoing state funding of higher education and university research for the first time. To prepare the way for this, a Royal Commission sat in 1920, recommending a capital grant of £113,000 and an annual grant of £49,000 for the university. In Ireland, the revolution established a new state which was unsympathetic to TCD, its unionist traditions, and its wartime record. Following the signing of the Anglo-Irish treaty on 6 December 1921, Prime Minister David Lloyd George made it clear to TCD that all future financial claims should be taken up with the new Irish government, and the Free State government, in turn, made it clear that they would not honour the recommendations of the Royal Commission of 1920. It was not until 1947 that Trinity College Dublin would receive a state grant for the first time from the Irish government. This followed decades of slow adjustment to the new political regime. While Trinity still displayed the trappings of the old regime – singing ‘God Save the King’ and flying the Union Jack into the late 1930s – it also attempted to build a solid working relationship with the new one, giving honorary degrees to leading figures in the Free State, such as the President of the Executive Council (and veteran of the 1916 Rising) W.T. Cosgrave, in 1926. The process of readjustment was fraught, contested by students and staff alike, and fought out in official ceremonials, student societies, and in the day-to-day business of the university. Trinity College Dublin’s experiences a century ago are most likely unique in the history of universities. A.A. Luce, one of three fellows of TCD to fight in the Great War and one of the defenders of Trinity on 24 April 1916, commented in 1965 that ‘historians may say that Trinity backed the wrong horse’. Trinity’s case demonstrates the richness of university history and the tensions between the international connectedness of scholarship and its national and local environments. This post has been kindly contributed by Dr Triona Fitton, who has recently published a monograph on the hidden history of philanthropy at the University of Kent. Dr Fitton also blogs about her research here. The philanthropic foundations of the University of Kent were laid during the early fundraising efforts of the ‘Sponsors of A University in Kent’; the collective of influential local people whose aim was to put forward a bid for a University in the county. 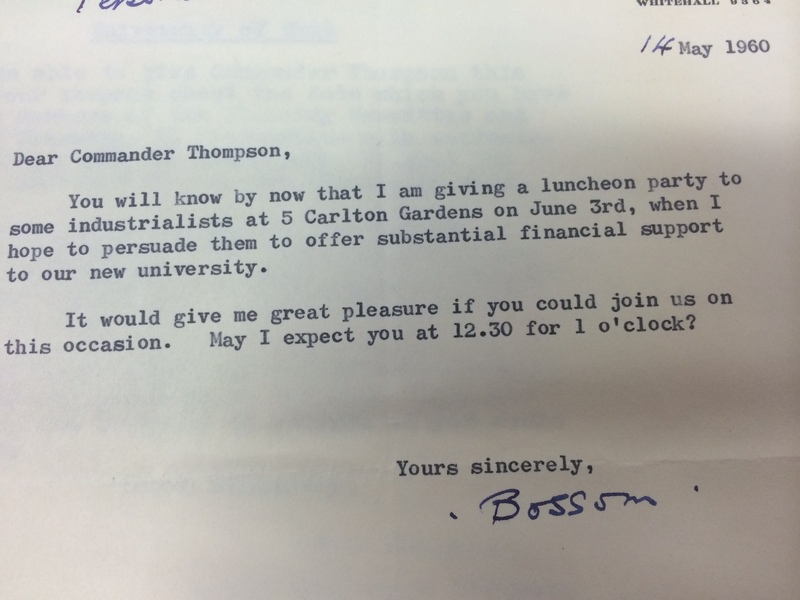 Their first appeal began informally in June 1960 when University supporter Lord Alfred Charles Bossom, a former architect and Conservative MP, hosted a luncheon at his house in Carlton Gardens. The plan for the luncheon was to invite key local industrialists and businessmen, with an aim of enticing them to contribute to a fund for the new University in Kent. Bossom’s invitation to Commander Thompson, courtesy of the University of Kent Archives. Just prior to the luncheon, the Sponsors received word that Pfizer Ltd., an American pharmaceutical company, had pledged a donation of £50,000. This is equivalent to over £1 million in today’s money – the first and largest of any company donation. Pfizer had developed a subsidiary in the UK in the early 1950s, establishing a vast 80-acre site in Sandwich in 1954 and cementing its ties with the county. Pfizer remain one of the top donors in the history of giving to the University of Kent. In the last 20 years they have also funded a chair in Medical Statistics, provided over £500,000 to fund the head of Medway campus’ School of Pharmacy, and given £20,000 to the Kent Institute of Medicine and Health Sciences for library materials. Their strong bond with the University’s scientific and industrial progress is demonstrated by Kent Innovation and Enterprise (‘KIE’, the University’s dedicated business support department) moving some of their services to Discovery Park, the former Pfizer site in Sandwich, which is now an international hub of biotechnology, life sciences, medical research and business. Pfizer still retain a presence at the site, but the relocation of KIE will aid the development of networks and collaboration between industry, students and academics. 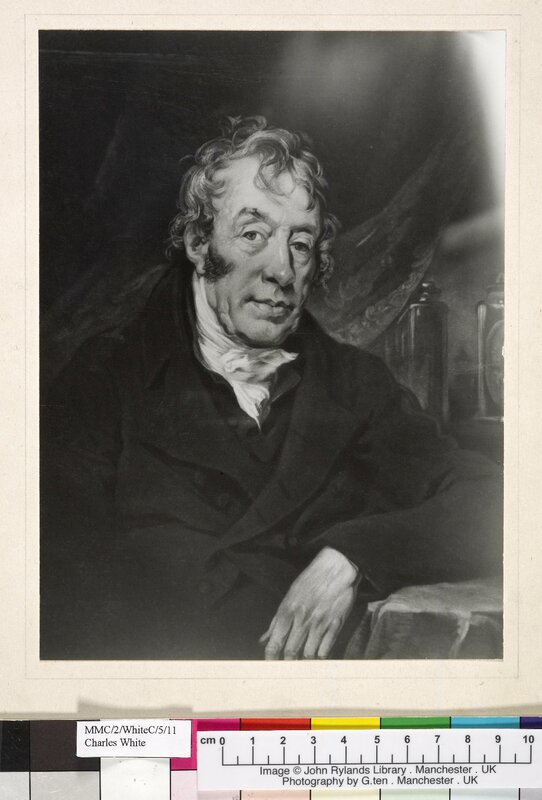 The original donation from Pfizer established a pattern of knowledge-transfer and industry partnerships which has an enduring legacy at the University of Kent. Back in 1960, the donation marked a momentous start to the University’s initial appeal. The gift was announced during Lord Bossom’s prestigious luncheon, and became a marketing tool for encourage other local industries (which included breweries, cement manufacturers, paper makers, oil refineries and engineering companies, among others) to themselves contribute. However, although the Pfizer donation was succeeded by many other generous donations by companies such as BP, Shell, Unilever and Associated Portland Cement, no early corporate donation came close to the £50,000 donation that started it all. Image courtesy of “University News.” The Times [London, England] 1 June 1960: 16. The Times Digital Archive.